What can I send to Pakistan? What items are restricted? If you’re planning a visit to Pakistan, whether it’s a business trip, a long holiday to see the sights and explore the wonderful countryside, or perhaps you’re relocating, there’s always the risk that your suitcase may be overweight and that you’ll be forced to pay extra charges to take it on board the plane. Or you may want to take oversized or unusual items and equipment for activities, such as skiing or snowboarding in the mountains, or a diving kit and gear for scuba diving and snorkelling. If this sounds like an issue you might have and need to resolve, Send My Bag might be the answer you’re looking for. When you book a collection from us, we can pick up your bag, equipment or extra luggage right from your front door and deliver it to your accommodation in Pakistan, wherever that might be. It saves you from all the hassle of having to transport awkward or heavy bags all the way from home to your destination or resort, and can also save on the extra fees you might incur. It’s quick and easy to organise a shipment via Send My Bag and it will get your extra luggage there safely and reliably. Students can also use the services of Send My Bag to transport their belongings to/from their student accommodation when moving to Pakistan or abroad from Pakistan for their studies. You can send your luggage and boxes to Pakistan with Send My Bag. If you are going sightseeing in Pakistan, if you are going backpacking, or if you are moving abroad to Pakistan to live, you can save yourself a lot of stress and hassle by sending your possessions with Send My Bag. You can bring lots of your favourite belongings with you to Pakistan to help ease homesickness. With your luggage taken care of, you can get on with sightseeing, sunbathing or skiing, or whatever you have come to Pakistan to do. Send My Bag has numerous international routes, with a great-value flat rate for each route up to a massive 30 kg. To learn more about sending luggage to Pakistan, visit our ‘How it works’ page, or our ‘FAQs’. Pakistan has around 30 golf courses to choose from, with Karachi, Royal Palm and Rawalpindi being highly rated. Your golf clubs needn’t become burdensome while travelling; instead you can send your golf clubs to Pakistan with Send My Bag, allowing you to travel light. Golfing is so much more enjoyable if you are able to play using your own golf clubs, rather than renting some, so consider sending your golf clubs with Send My Bag. Make sure you find out how best to package your golf clubs by visiting Send My Bag's golf clubs shipping page. Pakistan has some amazing cycling routes, most notably the Karakoram Highway with its breath-taking scenery. You can send your bicycle to Pakistan, to your first hotel and cycle along the highway as far as you like, and then have your bike picked up from your final destination. Sending your bike to Pakistan couldn’t be easier. If you send your bike you will avoid oversized baggage fees and won't have to carry the bike to and from the airport. Read our information page on sending bicycles to learn how to safely package your bike. Some people may not be aware of the opportunities for winter sports in the mountainous regions of Pakistan. You can go skiing or snowboarding there, with the resort of Malam Jabba due to reopen this winter. Why not send your skis and the rest of your luggage to Pakistan to help you better enjoy your journey, without having to drag heavy skis and bulky clothing along with you. Read our ski shipping page to find out more. If you are attracted by the Pakistani way of life and are moving to Pakistan permanently, you may need to think about international removals to Pakistan in order to transport all of your possessions. Take care to research removal companies thoroughly and make sure all items are carefully packaged so that they won’t get damaged in transit. Pakistan has many good universities, including the National University of Sciences and Technology, Quaid-i-Azam University and the University of Karachi. Students choosing to study abroad in Pakistan can send their belongings to Pakistan with Send My Bag. This could be books, writing materials and everyday items such as clothes. By having their favourite belongings from home, students will be able to quickly settle into student life in Pakistan. To find out more about student luggage shipping, take a look at our student removals page. You can also send a parcel to Pakistan with Send My Bag ? a great idea if you need to send a smaller number of items, or if it suits you best to send things in a box. Sending parcels is a great way to stay in contact with home as care packages can sent be back and forth. Make sure you choose a sturdy box when sending a parcel to Pakistan and tape it up well so nothing gets damaged in transit. Take a look at our parcel shipping information page to find out what you can send with Send My Bag and how to best package your items. You could consider using air freight to send items to Pakistan. This service usually takes one to two days. You need to consider the size of your shipment to determine what you would have to pay, and you need to factor in the cost of paying for a customs agent to handle customs clearance for you. In addition, you need to transport your items to and from the airport somehow. Costs could, therefore, quickly mount up. If you send internationally by air freight to Pakistan your items will likely arrive at one of the major airports, such as Jinnah, Gwadar or Quetta International Airports. You could go for sea freight or container shipping to transport your possessions to Pakistan, instead. This is a good option for very large items, such as a snooker table or even a car. This service is much slower and can be less expensive than air freight, but you will still need to use the services of a customs agent and will need to sort out how to get your items to and from the ports ? so the cost could be more than expected. When using container shipping to Pakistan your items will most likely arrive by ship at one of the major sea ports, such as Karachi or Port Qasim. The climate in Pakistan can be hugely varied depending on season, altitude and location. One of the highest temperatures in the world has been recorded there, yet the mountains in the north are usually covered in snow. Temperatures soar during the summer, with average temperatures of around 38°C and hot winds inland. Winters are generally cold with average temperatures sitting around 4°C in Punjab and below freezing further north. The currency used in Pakistan is the Pakistani Rupee, and the official languages of the country are Urdu and English. 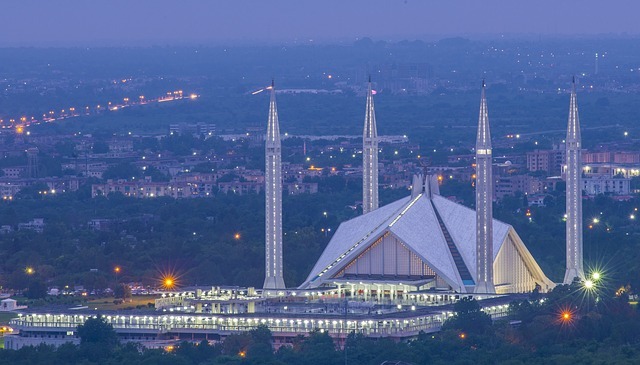 Pakistan is a hugely diverse country that draws tourists to attractions of all kinds, from the ruins of ancient civilisations such as Mohenjo-daro and Taxila, to the Himalayan Mountains in the north where winter sports prevail, and the beaches of the Arabian Sea where you can practise scuba diving.